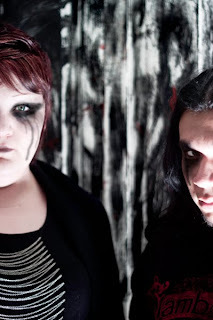 Morphine Killer is a duo band from Stanton, California sung by the angelic voice of Belle Roko with her gloomy and dark toned lyrics combined with the growling vocals of Eski. 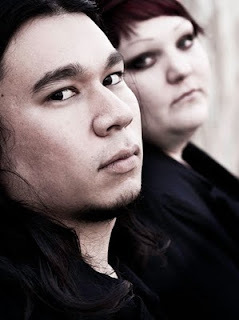 Together with crushing guitar cords, thundering bass, and surging beats of Eski and the keyboard mastery of Belle Roko, they created their metal core music using simple technology from their home, but with big studio results. Listen to a compilation of tracks from their newest EP, Nightmares including a song from thier first release, Unpologetic on The Great Unknowns Presents. Originally founded in 2007, Eski played in two previous bands, Reckoning Day and Honor the Fallen. While those two band projects failed to take off, Eski and solo artist and close friend, Belle Roko decided to take a leap and create a band of their own. Within two short years of writing lyrics and creating music together, Eski and Belle became Morphine Killer. While playing live band with only two members it is a near impossible challenge, the duo plans on expanding their live line up in order to tour locally and beyond. Before you and Belle worked on the music together, were you close friends before? We didn't know each other, but knew of each other before we met. We've been going out for the past 5 years, and pretty much after meeting each other, we knew we had music as a common background. How long did it take to create Unpologetic and Nightmares? They always say you have your whole life to make your first album, and a year to make your second. From start (demos and such) until the release, we had been working on and off writing Unapologetic from July 2007 (when I consider forming) until about April 2009. We worked on the tracks for Nightmares from July 2009-October 2009. Did you and Belle play all the instruments on the EP? Yes, we did. Belle did the keyboards in a couple of the songs, and I did the bulk of instruments. What I would do is maybe write a guitar riff first, and record it with a basic click. Then I'll program a drum part that is very similar to the riff I'm playing (I never use pre-made beats, you can't get a real feel of a part if you're following something pre-made) and build off of that. It's been a lot more liberating to know every part that's going on because you recorded it. I know there is a personal meaning behind the name of your band. Where did the name Morphine Killer come from? It's about Belle's mom, who was on a morphine drip near the end of her life, which is also what the song "Morphine Killer" is about. So, are a lot of the lyrics part of Belle's dark and real past then? Can you give examples, if it isn't too personal? It's about 50/50 with her vocals/songs being about her dark stories, and mine being about my own dark tales. There's a lot of darkness that sometimes people don't like to hear about, like a movie with a really dark storyline. But sometimes it takes real experiences to get a real performances. The song "Unapologetic" to us is definitely aimed towards the type of people in our lives (and there are many) who just try to use "sorry" as an excuse to keep on making people miserable. "Morphine Killer" being about Belle's mom, and "She's Slipping Away" is also about her mother, but more of the dealing with the end of her life actually happening, and the emotions she went through. So, what is in store of Morphine Killer? Right now we are working on about 10-11 more songs for a new CD, which we hope to have done in the coming months! Do you plan on expanding the band for live performances? We would love nothing more than to bring our music to a live setting! We currently don't have any live musicians yet though, so we need to start looking!